Cryptic Studios' upcoming Neverwinter won't be an MMORPG, but it will probably still require a unique payment model. Atari and Cryptic Studios announced Neverwinter this week, a Dungeons & Dragons licensed game rumored to be an MMOG before its announcement, but revealed as an online co-op game instead. Despite the change, Cryptic says the game isn't planned as the type of product it can put a retail price on and forget about. 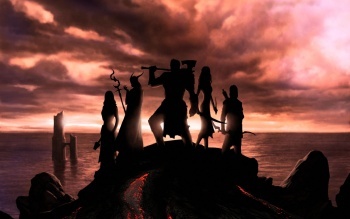 In an interview with Gamasutra, Cryptic co-founder Jack Emmert compares Neverwinter's mechanics to Borderlands, which made co-op an easy experience, and says that he hopes to create a game as good as Dragon Age or Oblivion. Both of those RPGs have what Cryptic calls "vignettes," or fun quests that players stumble upon. It's these vignettes that drove the game away from the MMORPG space, as Cryptic didn't feel they fit with the typical "kill 10 orcs" model, and that to make an MMOG with vignettes requires not only talent, but a huge amount of resources. Emmert still plans for Neverwinter to constantly grow as Cryptic adds to the experience, and may offer a microtransaction or subscription model to support its expansion. Emmert says Cryptic hasn't announced a final business model for Neverwinter yet, but when asked if he was going to "slap a price on the box and forget about it" he replied: "No." Emmert indicates his resistance to a subscription model, as he believes it's "extremely demanding" because "gamers are very picky, and they should be. "We envision this as an online product that will continue to grow over time, that we continue to add content to," Emmert revealed. "So whether it's subscription fee, whether it's free-to-play, whether it's microtransactions, whether it's pay-by-the-minute [laughs], whether it's some sort of Ponzi scheme that I haven't figured out, I don't know. None of that has been announced." RPG fans looking forward to Neverwinter might see a regular payment model as a negative, but it really isn't. This only means that Cryptic plans to make Neverwinter a game that will continue to provide content to players, and it can't work for free. Emmert says Neverwinter is a "new direction" for Cryptic, and I'm looking forward to seeing what it comes up with. We'll find out more as the game gets closer to its 2011 release on the PC.